[Some churches, like in New Zealand, are taking extreme precautions to prevent the spread of the recent Swine Flu bacteria. Their answer was to prohibit the common participation in Communion wafers, the Communion chalice and the shaking of hands. 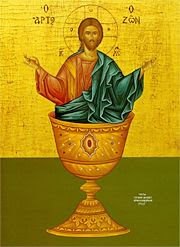 In response to similar fears over the years, the Orthodox Church has always taken the stand that the Cup of Christ is not a cup that delivers death, but it is the Cup of Life. On the more practical level, some Liturgists say it is to prevent diseases that hot water became a required ingredient in the Communion Cup and why a cloth was shaken over the Holy Bread and Wine during the reciting of the Creed. CAN YOU GET ILL FROM TAKING THE COMMUNION CUP? Contrary to popular opinion, wine, and other beverages of antiquity produced through fermentation, were probably more important in providing disease-free drinking fluids than in their tendency to intoxicate. Ancient Greeks drank their water mixed with wine, and also used wine to cleanse wounds and soak dressings. More recently, military physicians of the last century observed that during epidemics of cholera, wine drinkers were relatively spared by the disease, and troops were advised to mix wine into the water. Wine has been shown to be an effective antiseptic even when the alcohol is removed. In fact, 10% alcohol is a poor antiseptic, and alcohol only becomes optimally effective at concentrations of 7;0%. The antiseptic substances in wine are inactive in fresh grapes because these molecules are bound to complex sugars. During fermentation these antiseptic substances are split off from the sugars and in this way become active. These molecules are polyphenols, a class of substances used in hospitals to disinfect surfaces and instruments. The polyphenol of wine has been shown to be some thirty-three times more powerful than the phenol used by Lister when he pioneered antiseptic surgery. In preparing communion, the hot water that is added to the wine will increase greatly the antiseptic effect of the polyphenols. Disinfection occurs more rapidly and more effectively at 45 degrees centigrade than at room temperature (22-25 degrees). Another contribution to the antiseptic effect comes from the silver, copper, zinc that make up the chalice itself, ensuring that microbes are unable to survive on its surface. Throughout the centuries, no disease has ever been transmitted by the taking of Holy Communion. Diseases, such as Hepatitis B, known to be transmitted by shared eating utensils, have never been acquired from the communion spoon. HIV is known not to be transmitted through shared eating utensils, and considering the antiseptic qualities of the Holy Communion received by the faithful, there is no likelihood of acquiring HIV infection through the Common Cup.